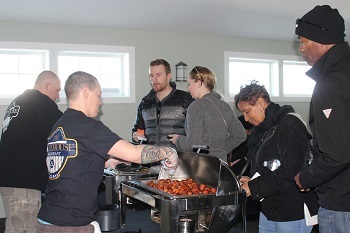 You are here: Home / Top News / Taste of Solomons Was A Fantastic Food Experience! 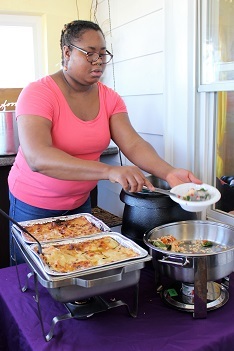 Taste of Solomons Was A Fantastic Food Experience! Editor Note: The restaurant is not notified before the fact and all meals are not paid for by the restaurant. If there is a bad review, notify us. and we will come back another time and do another one. 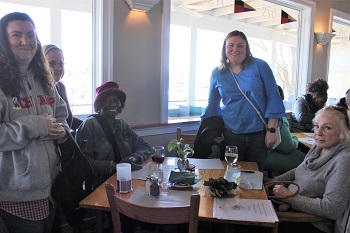 It was a beautiful spring day to enjoy the Taste of Solomons. 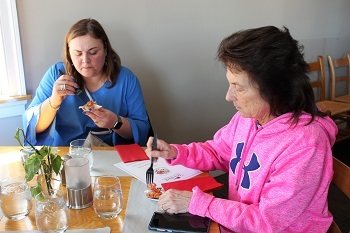 This annual event allows visitors to sample dishes and drinks at restaurants throughout Solomons, offering an opportunity to learn about new dishes at a favorite restaurant or trying out a new place to eat. I gathered up a group of friends, told them to put on their walking shoes and we headed down to the Island. 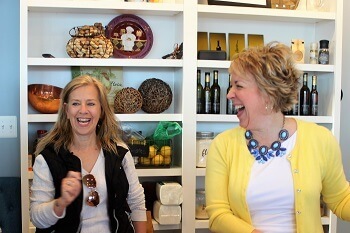 Taking several friends means you can “divide and conquer,” with everyone getting something different and sharing. 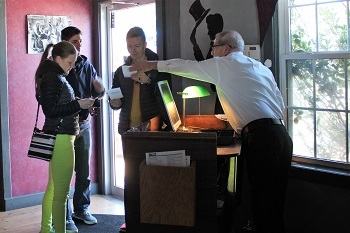 Tickets were $5 per sample, with samples varying at each restaurant. 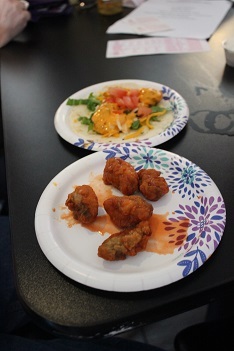 Depending on the location, some served a small plate with several items and others had one item per ticket. 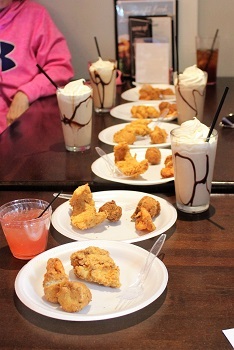 Several restaurants offered drink samples. Tickets could be purchased at any restaurant or at the Berkshire-Hathaway/McNellis Realty building, located across the street from the Solomons Gazebo. The proceeds from the event will be used toward the 4th of July fireworks. Beginning at the far end of the Island our first stop was Charles Street Brasserie. We enjoyed a beautiful view of Back Creek as we waited for our first taste –Fried Oyster Rockefeller, Blackened Scallops topped with a parmesan aioli sauce and BBQ Duck Sliders. The Fried Oyster Rockefeller were excellent, with the oysters fried atop a warm creamy sauce with a touch of grated cheese. The Blackened Scallops were very good. Topped with a parmesan aioli sauce they offered a hint of spice. 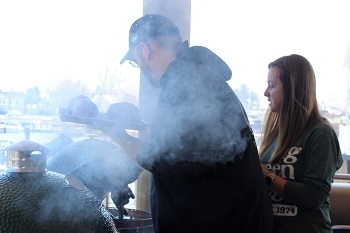 The BBQ Duck Sliders were great! Something we would come back for. Patrick, the bartender, talked us into a Grapefruit Hemingway Cocktail. Made with gin, lime juice, simple syrup and grapefruit juice, was a light, somewhat fruity cocktail. According to Patrick, the bartender, it is a favorite with their regulars. 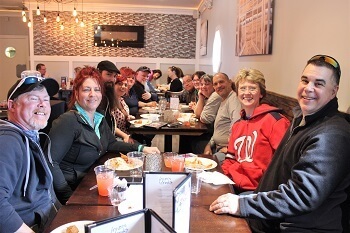 Charles Street Brasserie, 120 Charles St., Solomons, MD 20688; 443-404-5332, www.charlesstreetbrass.com. The Lighthouse Restaurant & Dock Bar served their signature Crab Dip with Crab Chips, always a favorite. The dip was thick and creamy with lots of crab meat, and chips dipped in Old Bay. The Bourbon Glazed Bacon Wrapped Scallops were delicious. The glaze was sweet with just a tang. 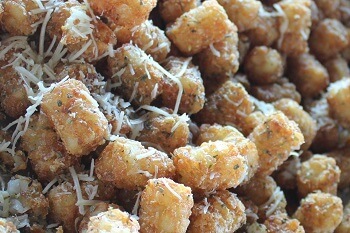 Lisa said that the Lighthouse has the best happy hour on the Island, offering $2 beers and most appetizers half off! The restaurant has a great bar area and lots of deck seating. The Lighthouse Restaurant & Dock Bar, 14636 S. Solomons Island Rd., Solomons, MD 20688; 410-231-2256; www.lighthouserestaurantanddockbar.com. 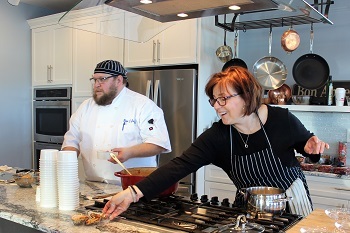 No Thyme to Cook is Southern Maryland’s home for cooking classes, offering fun, educational classes throughout the year. 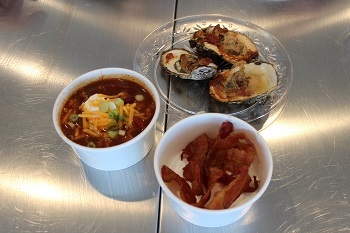 We sampled Grilled Oysters Canvasback which were rich with a hint of spice. 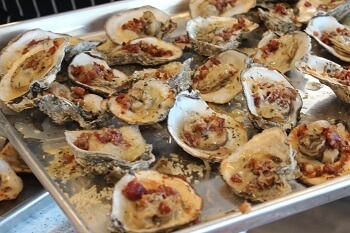 I could have eaten the Butter Brandy Bacon & Parmesan and Candied Bacon all afternoon. 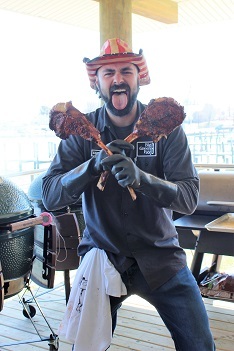 On the deck overlooking the harbor, staff was cooking the Upside-Down Chili. 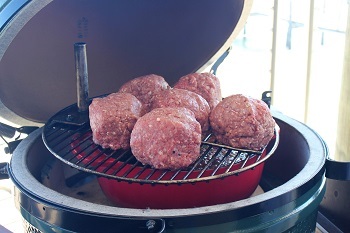 For my grilling friends that love their Green Egg Grills, they mixed chili sauce, placing it in a large pan under the grill top. 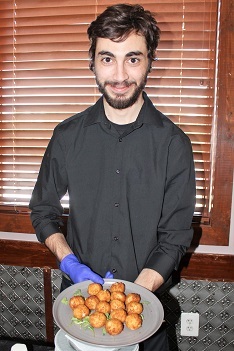 The large meatballs were placed on the grill over the sauce, allowing the meat to drip into the sauce. When done, the meatballs were broken up into the sauce. 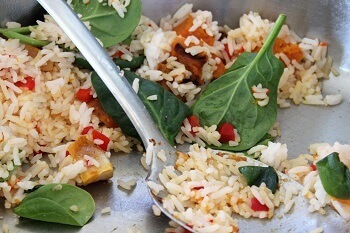 Very, very tasty! 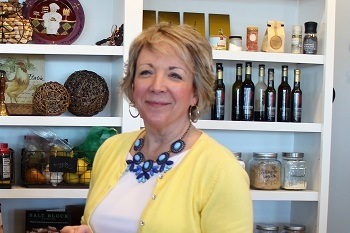 No Thyme to Cook, 14624 Solomons Island Road S, Solomons, MD 20688, 443-624-5048, www.NoThymeToCook.com. No Thyme to Cook also featured 50 oz. 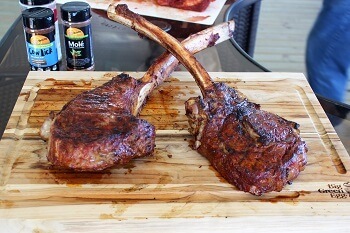 bone-in rib-eye steaks from Sassafras Farms. Providing top quality beef from their herd of 100% registered Angus cattle, Sassafras Farms has locations in Huntingtown and Dunkirk. Family-owned and operated, they offer year-round private treaty bull and heifer sales. 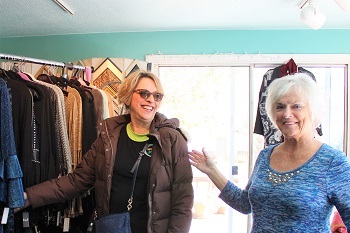 Buy local – you support your local community and will get a top-quality product! 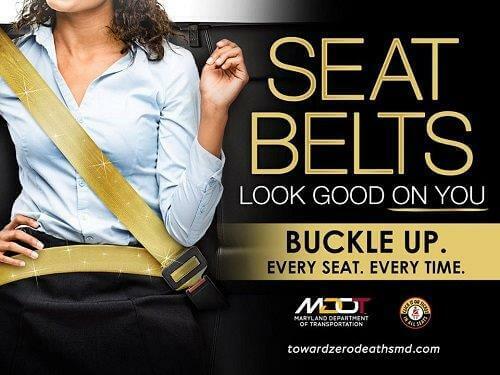 For more information visit www.sassafrasfarmmd.com. 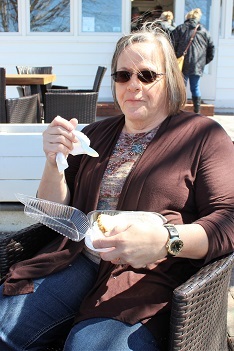 Sitting under large tress on the front lawn of the Lotus Kitchen/ Kim’s Key Lime Pie, we sat a while to watch the world go by. We sampled a Pork Taco Bowl and Butternut Squash Lasagna. 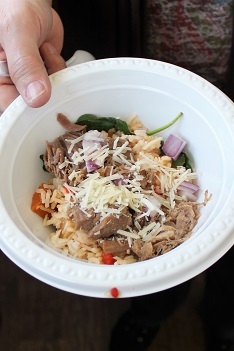 According to Karen Barnes, the Pork Taco Bowl was made with rice, sweet potatoes, baby spinach and red peppers and “bursting with flavor.” The Butternut Squash Lasagna was thick and flavorful. I had the Key Lime Pie and is a must have! Made from the recipe of the original owner, Kim, it is absolutely the best Key Lime Pie north of the Keys! Lotus Kitchen featuring Kim’s Key Lime Pies, 14618 Solomons Island Rd., Solomons, MD 20688; www.lotuskitchensolomons.com. At Island Hideaway we grabbed seats out on the deck before choosing our selections. 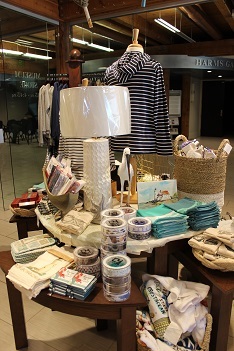 The restaurant is a cozy place, nestled by the water between Harmon House Shoppes and carmen’s gallery. 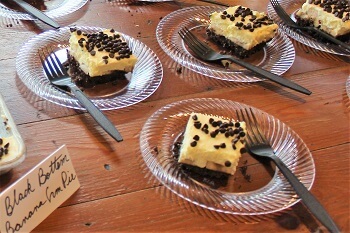 It was easy to start with dessert – the Black-bottom Banana Cream Pie was delicious, creamy, with its mixture of chocolate and banana. Excellent! The Cream of Crab Soup was thick and full of crab meat. 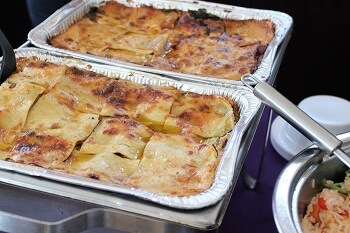 The Vegetable Lasagna was delicious, with creamy cheese and vegetables between layers of sweet potato pasta. The Meatball Crostini, a house-made meatball served in a marinara sauce and topped with grated parmesan cheese, was very good. 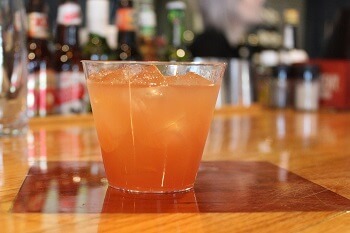 The Solomons Surfer will be a great summer drink. Made with Amaretto, coconut rum, cranberry and pineapple juices, it is one that should be consumed on their back deck while watching the boats (and world) go by. Island Hideaway, 14556 Solomons Island Rd. 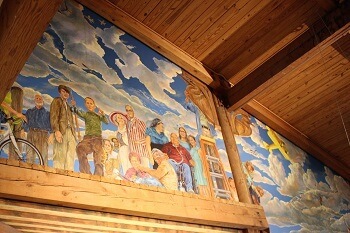 S, Solomons, MD 20688; 410-449-6382; www.theislandhideawaysolomons.com. Chris Donaldson, one of the owners of Island Hideaway, co-chairs the Taste of Solomons event with Charles Chappell. Chris said “the Taste gives everyone an opportunity to come down and see what Solomons has to offer. This is an amazing event that supports our fireworks for the 4th of July. 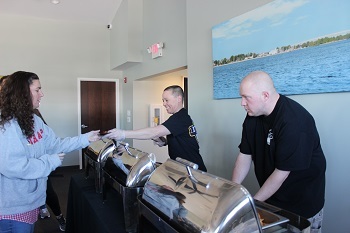 Everyone has a great time doing it.” While the event takes a great deal of time to coordinate, they volunteer to support the community and the businesses in Solomons. 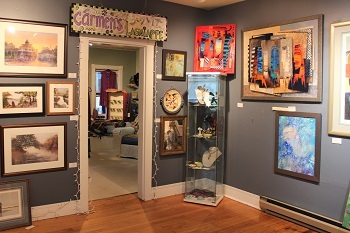 We did a quick stop at carmen’s gallery. 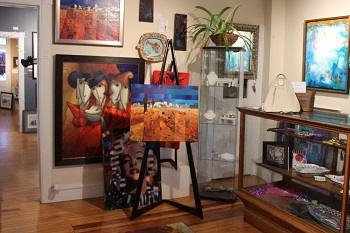 The gallery has a wide range of art work, a selection of women’s clothing, one-of-a-kind jewelry and beautiful gift ideas. 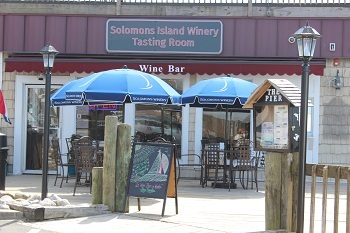 The Solomons Island Winery Tasting Room is next door to The Pier. 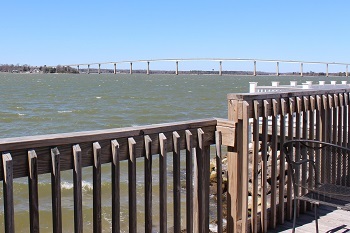 With a small outdoor seating area, visitors can enjoy a glass of wine and a view of the Patuxent. Offering something for everyone, we sampled three of my favorites, a crisp Pinot Grigio, Blueberry Pinot Noir that offered a hint of sweetness, and the subtle sweet Kiwi Pear Sauvignon Blanc. The tasting room is open Wednesday – Sunday, 11 a.m. – 6 p.m. Stop by and pick up a bottle or two! 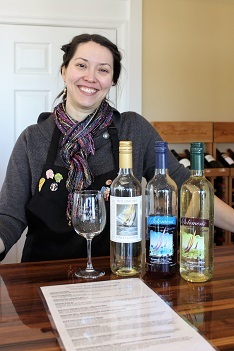 Solomons Island Winery, 14575 Solomons Island Rd. 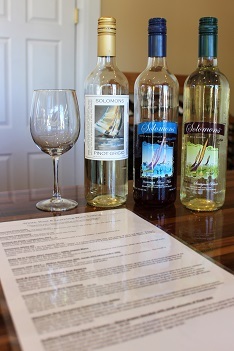 S, Solomons, MD 20688; 410-394-1933; www.solomonsislandwinery.com. 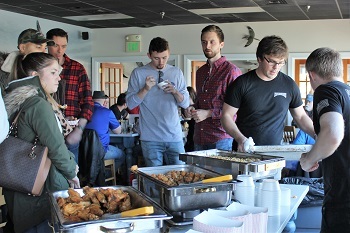 A Southern Maryland landmark, The Pier is the only restaurant sitting literally on top of the Patuxent River. 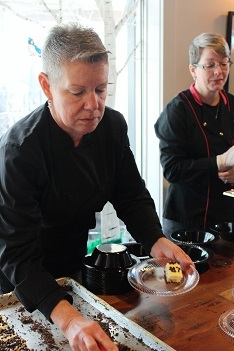 The tasting included an Encore Italian Sausage Sandwich and a beer-battered cod sandwich with remoulade sauce. It was worth the wait in line. The cod sandwich was lightly breaded and fried to perfection. 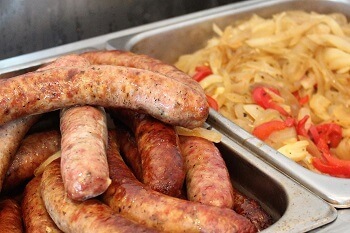 The Italian Sausage sandwiches were seasoned perfectly and were smothered in peppers and onions. 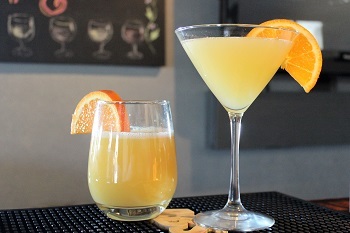 The Spring Sangria is just the right drink for an afternoon at their outdoor deck. 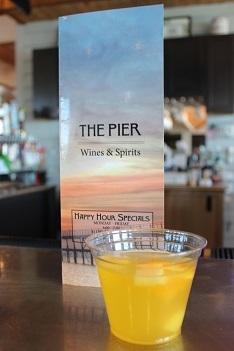 The Pier offers great assortment of seafood dishes. 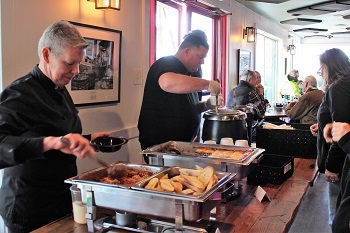 Sundays, from 9 a.m. to 2 p.m., enjoy a delicious brunch offering an omelet station, waffle station, carving station with top round, chilled shrimp, bacon, sausage, scrapple and more! The Pier Restaurant, 14575 Solomons Island Rd., Solomons, MD 20688; 410-449-8406; www.thepiersolomons.com. Kingfisher’s Seafood House was the last restaurant we enjoyed “on the island.” Owner Eric Faughnan was serving their signature Crab and Cheese Macaroni. 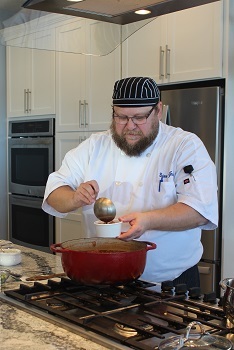 He loves being a part of the Island and said the Taste of Solomons “is a great way to get people to the island to visit all of the restaurants. 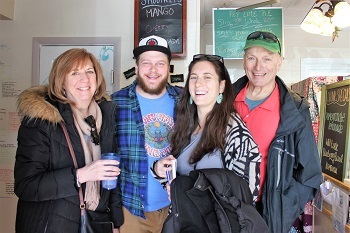 Visitors learn about new places to eat and have fun. 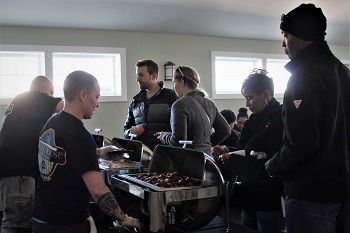 It is important for us to do more events like this.” In addition to Crab and Cheese Macaroni, Kingfisher’s served Truffle Tater Tots and Old Bay Wings. The Crab and Cheese Macaroni was creamy with chunks of crab meat. 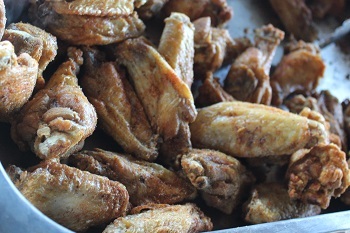 According to Fran, the Old Bay Wings were “nice and juicy with a tang!” The Truffle Tater Tots were crispy with a hint of garlic. 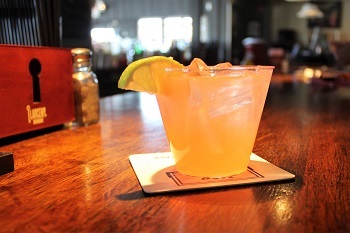 The Orange Crush will be a must have this summer, as you sit on the back deck having dinner. Kingfisher’s Seafood, Bar & Grill, 14442 Solomons Island Rd., Solomons, MD 20688; 410-394-0236; www.stoneysseafoodhouse.com/kingfishers. Located off the beaten track in Zahniser’s Yacht Center is The Dry Dock. 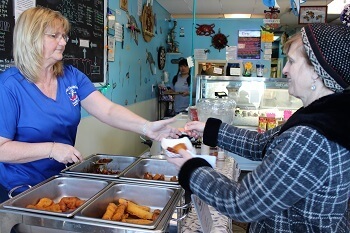 The restaurant is a long-time favorite of locals and boaters. 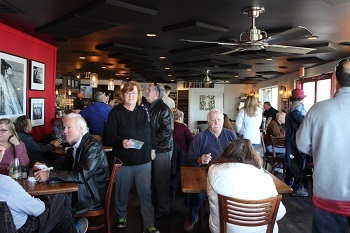 It was busy with first-timers and regulars. 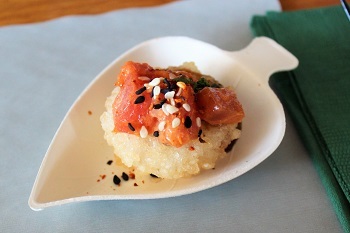 We found tables and were surprised by a sample of their Tuna Tartar, which was not on the list. 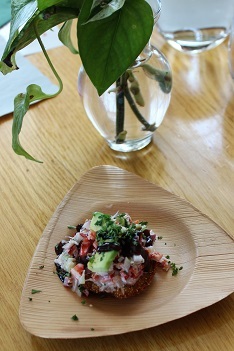 The tartar was both beautiful in its presentation and tasty. 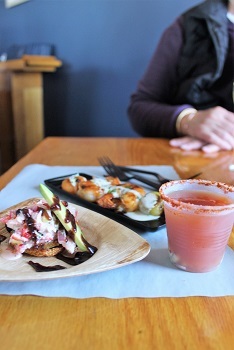 Karen got the Lobster Salad on a Fried Green Tomato and said “it makes the fat lady very happy!” Kathryn and Lisa were the brave souls that downed Old Bay rimmed Oyster Shooters. I tried Sweet Red Curry Glazed Melon and Shrimp Skewers that were delicious. 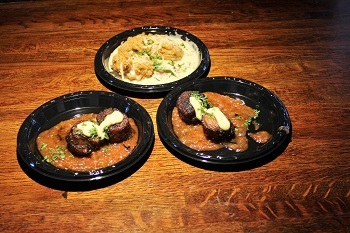 Before we departed, we received a second surprise, a coupon to “buy one, get one free dinner,” good through April 15. 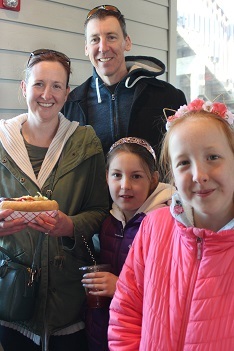 Calvert Marine Museum is an excellent way to spend an afternoon with family and friends. 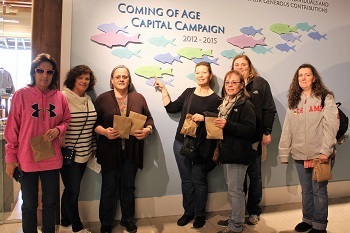 The museum provided a bag of Sea Salt Caramel Sweet Treats – which were great to eat on the way home! 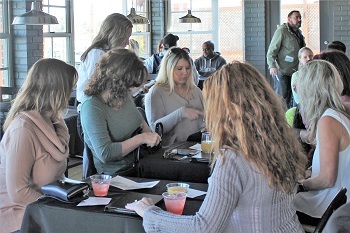 Calvert Marine Museum has just announced their summer Waterside Concert Series which includes Kane Brown on June 1; Earth, Wind & Fire on July 3; and Brett Eldredge on July 26. Calvert Marine Museum, 14200 Solomons Island Rd., Solomons, MD 20688; 410-326-2042; www.calvertmarinemuseum.com. 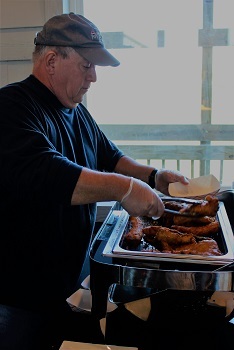 Angler’s Seafood Bar and Grill, located at the end of Lore Road, offered Buffalo Oysters, Oyster Stew, Boom Boom Shrimp Tacos and oven-roasted, open-faced hot turkey sandwiches with mashed potatoes. The oyster stew was thick and creamy, with a good taste. 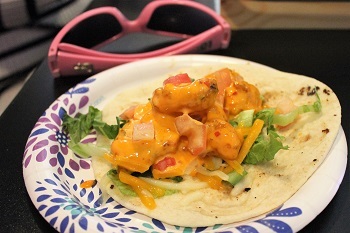 Boom Boom Shrimp Tacos were delicious with a tangy flavoring. 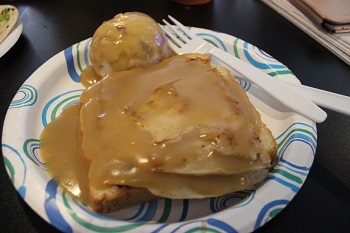 The hot turkey sandwich was a surprise – they had created a smaller version of the great sandwich they serve on the menu with homemade mashed potatoes. 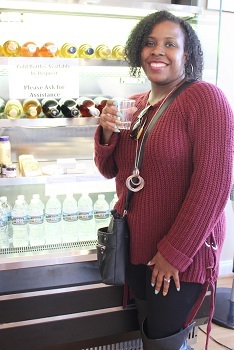 The drink was delicious! Kym’s Key Lime Pie was named after the bartender, with a nod to Kim who created delicious Key Lime Pies on the Island for years. 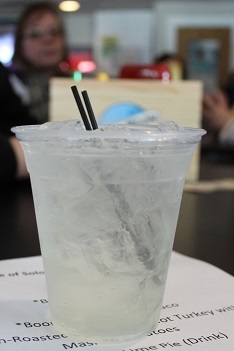 The recipe was simple, whipped vodka, rose’s lime juice and sprite, with that tart flavor of traditional Key Lime Pie. 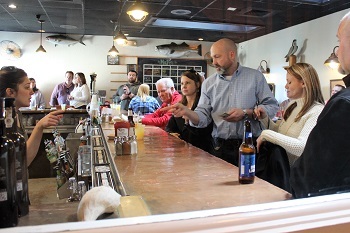 Kym Davis, the bartender, said “it has been crazy busy, but we have gotten a lot of good feedback. 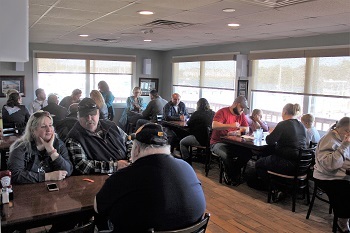 We have seen a lot of first time visitors to the restaurant that want to come back for a full meal.” Angler’s serves breakfast, lunch and dinner, Tuesday through Sunday. Throughout the week they have trivia night and music. 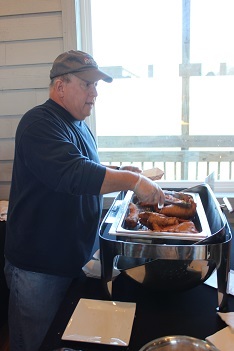 Angler’s Seafood Bar & Grill, 275 Lore Road, Solomons, MD 20688; 410-326-2772; www.anglers-seafood.com. 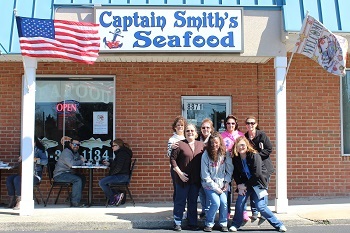 Captain Smith’s Seafood, located in the Solomons Shopping Center, is a seafood market, but don’t let that fool you. They can cook to order just about anything they sell in the store. It was crowded, but worth the wait. 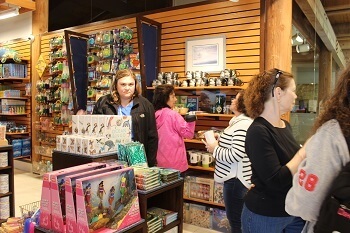 There were four choices available – and for one ticket you were able to pick three items. 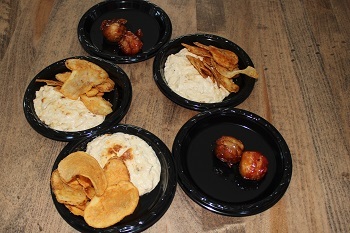 We sampled a delicious maple-glazed bacon-wrapped scallop that several people had recommended. 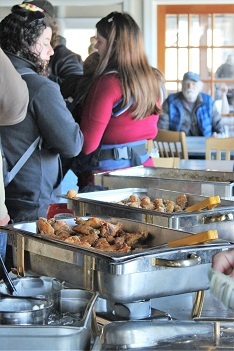 The Rockfish strips and haddock strips were very tasty, and we had some delicious fried oysters. 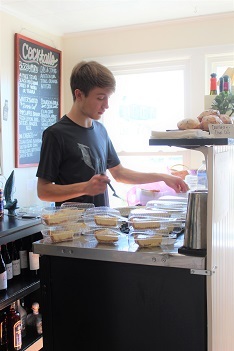 The oyster stew was thick and creamy, made from a recipe given to the owner, Chris Bowen, by his grandmother. 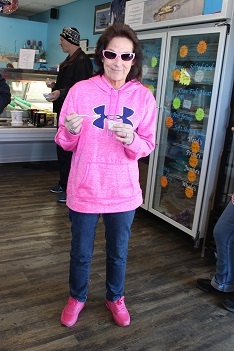 Dawn Bowen said “the market is completely ‘take-out.’ This event gives us an opportunity to showcase the fresh seafood we sell.” She was very happy with the number of people that had stopped by the store. Capt. 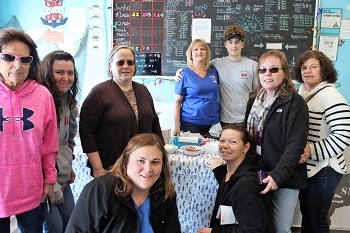 Smith’s Seafood, 13944 Solomons Island Rd. 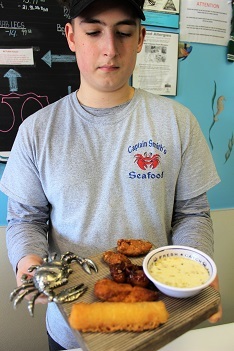 S, Solomons, MD 20688; 410-326-1134; www.captainsmithseafood.com. 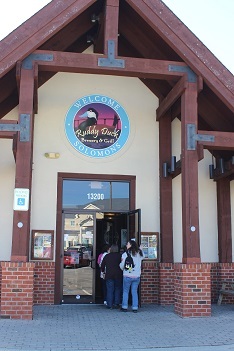 The Ruddy Duck is located north of the Solomons Volunteer Fire Department and shares a parking lot with the Hilton Garden Inn Solomons. 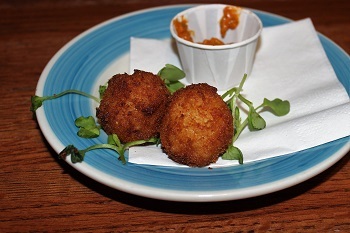 The Mozzarella Arancini, mozzarella balls topped with a red pepper and almond romesco sauce, was delicious with just a hint of heat. 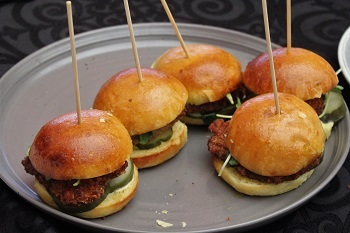 The Schnitzel Sliders were pork schnitzels, lightly fried, served on a bun with house sweet pickles, water cress and a herb Dijon and jalapeño jelly. 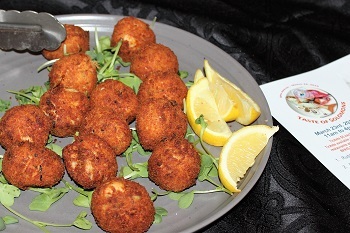 Haddock Croquettes were deep-fried and tasty. You could also enjoy one of The Ruddy Duck’s hand-crafted ales, all brewed on premise. And who says only men drink beer! Boomerang’s Original Ribs is well-known for their “fall off the bone” ribs. 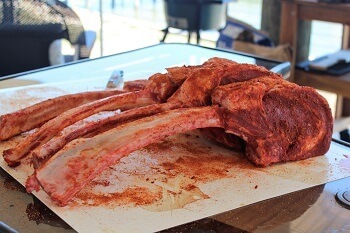 To eat you need to pick them up with your hands so you can get every morsel of meat off the bone. 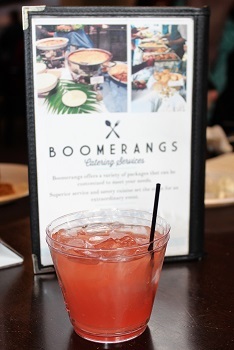 What many people don’t know is Boomerangs has great seafood. 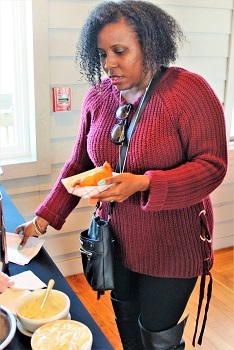 For the Taste of Solomons they featured several of the seafood items. 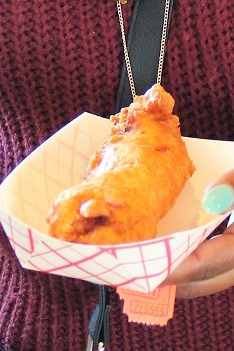 Included was a hand-breaded jumbo shrimp, fried to perfection, served with a hushpuppy with a delicious sweet butter. 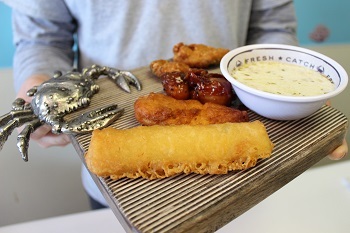 The hand-breaded haddock was one of the best fish dishes of the day. The drink was a Citrus Moscato Sangria, which tasted like a watermelon “Jolly Rancher.” Great summer drink! 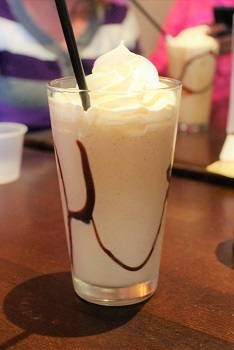 We made Boomerang’s our last stop so that we could enjoy one of Boomerang’s Mudslides. Thick, creamy, like a decadent dessert, It is the best drink to finish off the Taste of Solomons! Boomerangs Original Ribs, 13820 S. Solomons Island Rd., Solomons, MD; 410-326-6050; www.loveribs.com. 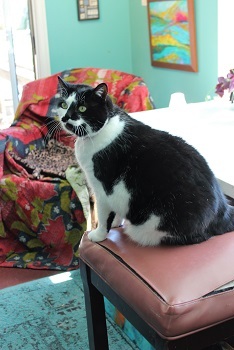 I want to send out special thanks to my friends – Lisa Dillon, Jill Sherman, Karen Barnes, Fran Watson, Heidi Walls, Nancy Weick, Kathryn Rivers and Molly Stevens – that accompanied me. They helped with the tasting and filled the day with memories, and kept us to a strict time table so we could make it to all 14 stops! After a day like this, filled with delicious food and drink, and the company of friends, all I wanted to do is take a nice long nap!